Reprinted by permission of the National Muzzle Loading Rifle Association / Muzzle Blasts magazine, April 2009. For information on the NMLRA please visit the website at www.nmlra.org. Webster's dictionary defines the phrase "in unison" as: in perfect accord; corresponding exactly. Art is a personal expression coming from the heart, mind and soul. In this rare case of two intimate artists, what emerges from their working together, whether individually rendered or a combination of thought, compliments one another. When asked about their work, Lally said, "It's been a dream for our work to be recognized as "art" instead of "craft". It [quillwork, and especially gunwork] always seems to be associated with "re-creation or replication" rather than identified as unique and original creations of artwork produced using 18th century methods, materials and design elements. I take great pains to create original designs and generally do not copy or reproduce other existing pieces of quillwork. 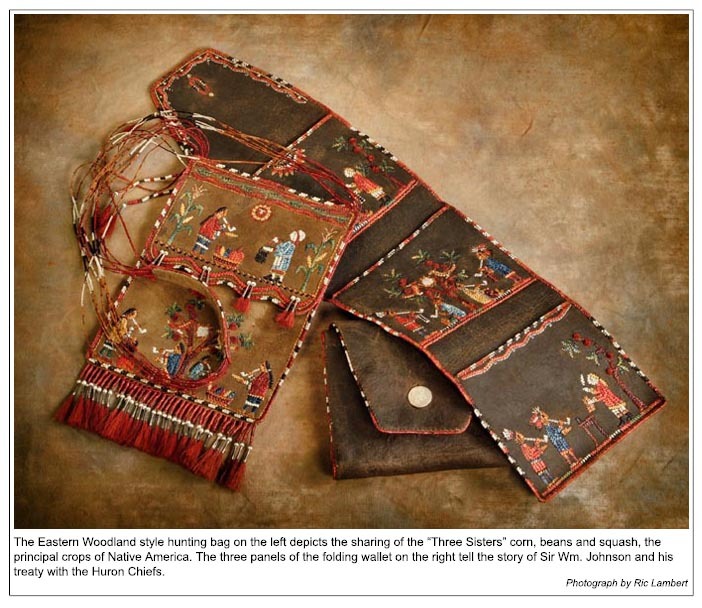 I always use brain-tan deer hide for my pieces and take great pride in using natural dying methods and colors that were used during the mid-18th century by the Eastern Woodland Indian tribes." 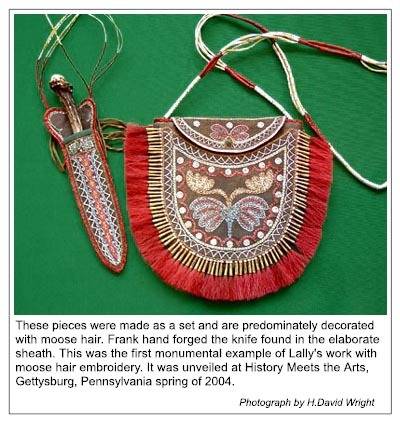 In the last several years, Lally has become known for intricate moose hair embroidery coupled with porcupine quills, enhancing the texture and impression. 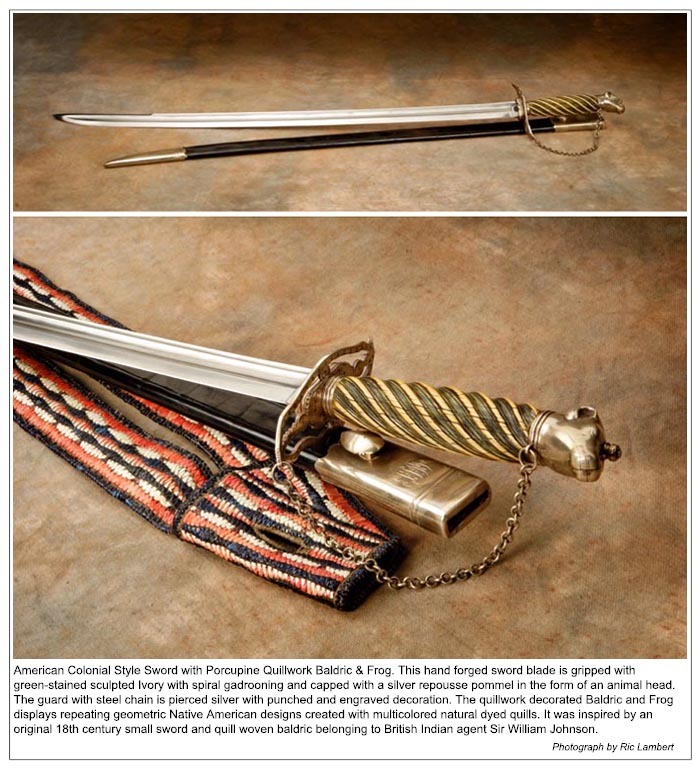 When asked about blending their artistic concepts, Frank commented: "At the 2nd annual meeting of the Contemporary Longrifle Association, Lally and I presented our first monumental duo piece, an American Colonial Style Sword with Porcupine Quillwork Baldric & Frog. This hand forged sword blade is gripped with green-stained sculpted Ivory with spiral gadrooning and capped with a silver repousse pommel in the form of an animal head. The guard with steel chain is pierced silver with punched and engraved decoration. 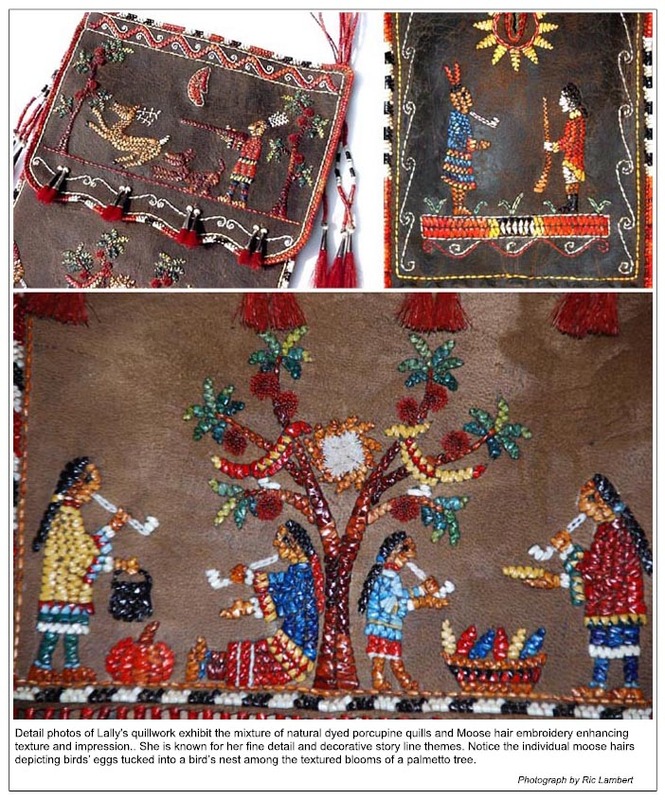 The quillwork decorated Baldric and Frog displays repeating geometric Native American designs created with multicolored natural dyed quills. I must admit it is still some of our best individual work and a milestone in our career working together." Frank and Lally wanted to create a work of art that would be a composite of their individual mediums. 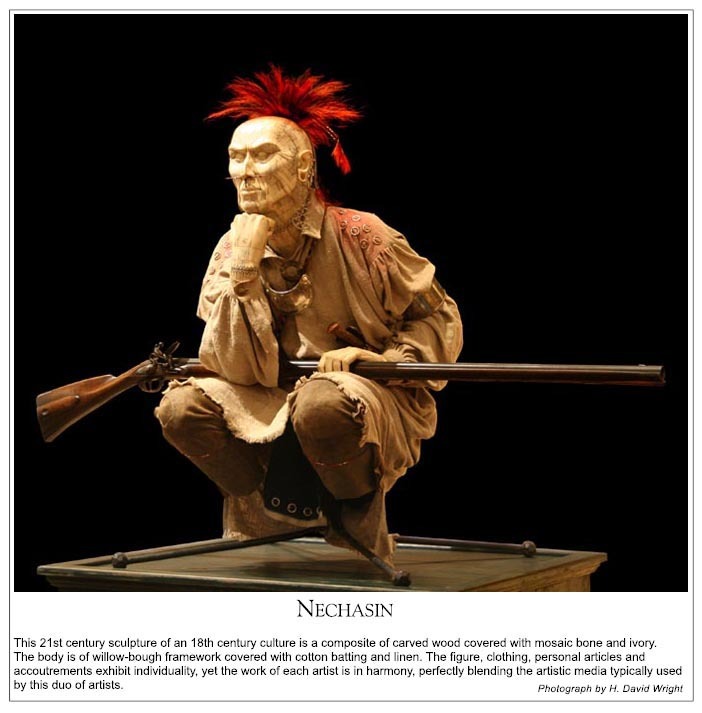 The concept evolved into a unique, powerful sculpture they named Nechasin. Pronounced, nay-Cha-seen, a Lenape ~ Delaware name meaning 'to be watchful'. This mixed media sculpture is a testament of 18th century culture. Originally Frank imagined a rifleman or other entity that may have carried the sword, but as the idea evolved, Lally's artwork dictated that the piece should be Native American, specifically Delaware. This tribe was known for fierceness and tenacity as warriors, however, they preferred to choose a path of peace when possible. 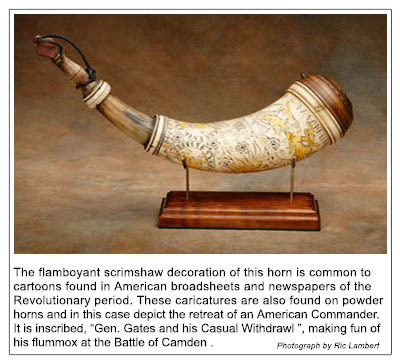 The sculpture incorporates a number of Frank and Lally's pieces, including a rifle, tomahawk, powder horn, and quillwork. Its head and hands are a composite of carved wood overlaid with mosaic bone and sculptured ivory. The body is willow-bough framework covered with cotton batting and homespun linen. His face shows the effects of stress and a troubled life. He is not old, yet you can clearly see the harsh elements; he is aged beyond his years. His hands are tense, almost cat like, even the hand under his chin is tense, not relaxed at all and ready to act. He is squatting and resting on the balls of his feet. He is not just getting ready, but always ready. His look is one of consternation and determination, with much pride and dignity. His tattoos are traditional designs. 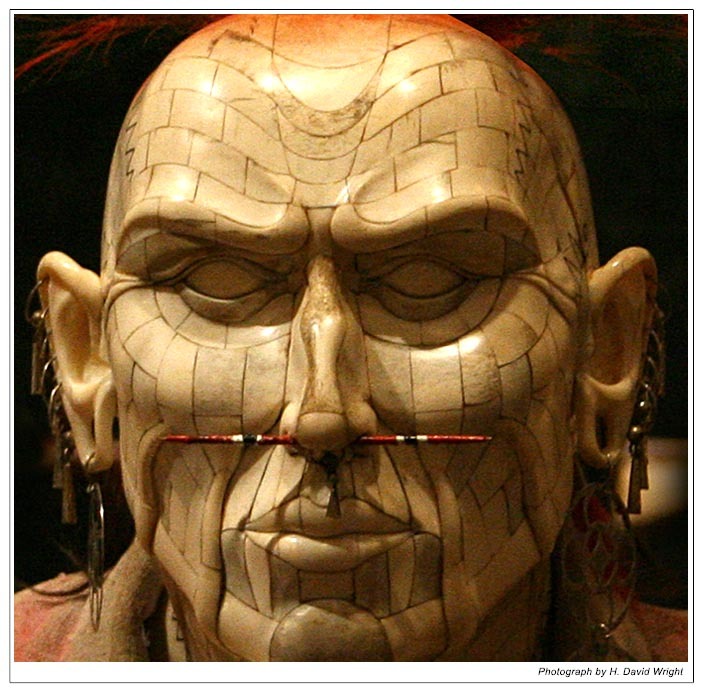 In Native American culture, tattooing was a sign of rank or to commemorate an event. 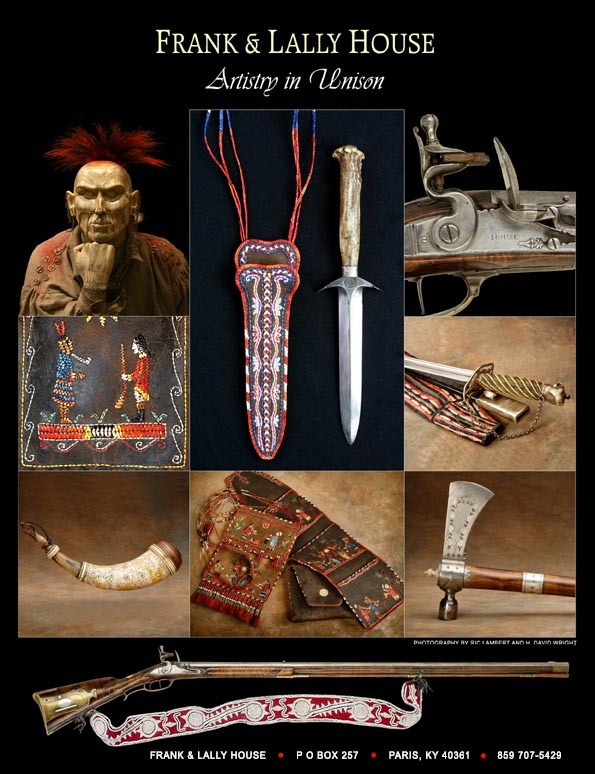 His quilled bag is Delaware, and his knife sheath is Iroquois, showing influence of trade among tribes. 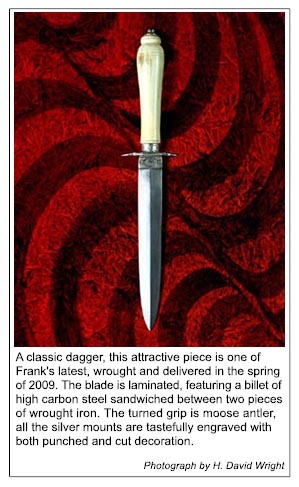 His scalp lock is made of hair cut from Frank's head. The porcupine quill adorned roach is braided into hemp cord, wrapped around two willow sticks, and dyed bright red using Cochineal bugs. The decorative silver cones hold deer hair dyed red and the paint is true vermilion. His breechclout is wool stroud and his leggings are smoked brain tan deerskin, dyed with walnut hulls and sewn with linen thread. His shirt is homespun flax linen and hand stitched. 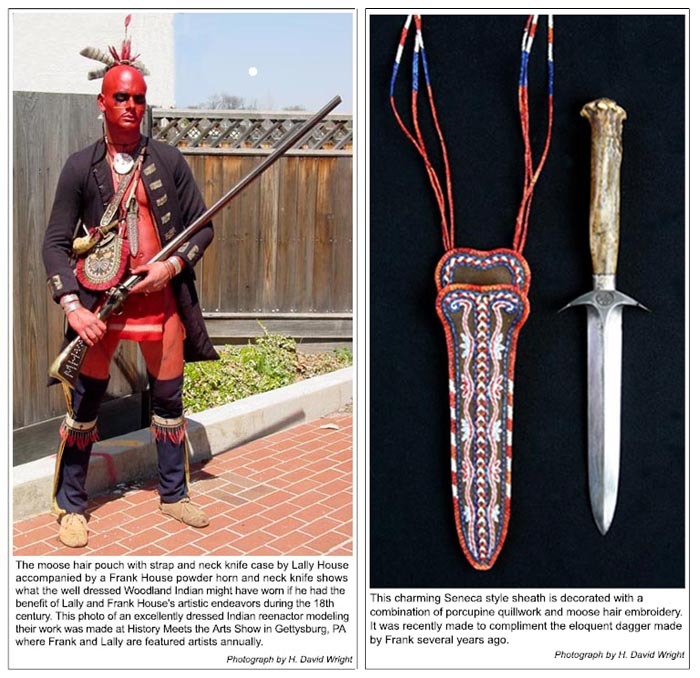 He is armed with an early smooth rifle showing French influence, and his powder horn is styled and decorated with polka dots, common characteristics of horns made for the Indian trade in central Pennsylvania. 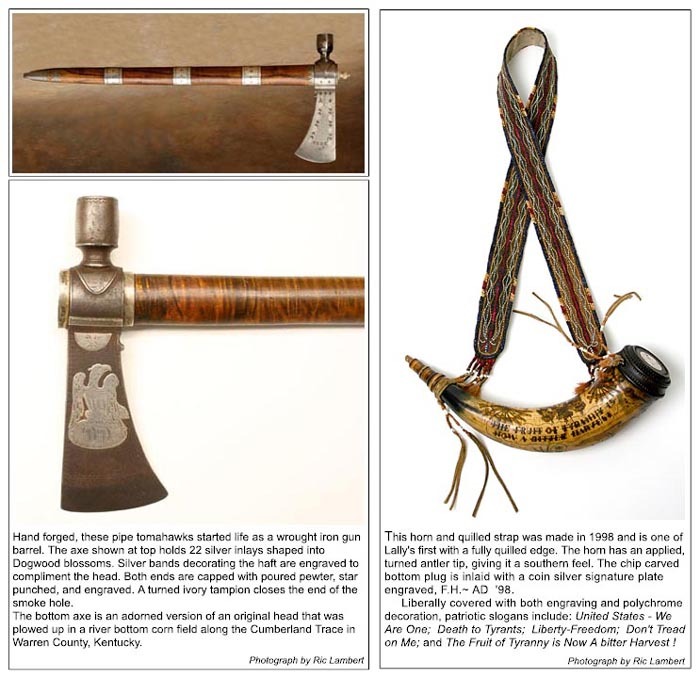 An original axe signed by Indian trader and gunsmith John Frazier inspired his pipe tomahawk. The haft is wrapped with porcupine quill braid. In creating Nechasin, Frank and Lally did not make an objective statement, but rather let Nechasin tell a life story, one of a culture now entirely lost. Frank purposely did not finish Nechasin's ivory eyes in hopes that the observer will derive their own interpretation of this highly creative, one-of-a-kind sculpture. When asked to describe the philosophical approach to their art, Franks says, "In conceptual art, the idea or concept is the most important aspect of the work. The part of this art that is not understood is the painful part - the idea." Samuel Beckett said, "Suffering is the main condition of the artistic experience." And so it is with Frank and Lally's work. Each piece of their unified work has a vivid story. Painstakingly, thousands of hours of thought-time and conversation are invested. When finishing a creation it's akin to giving birth, as months of careful planning, attention, and excitement finally becomes a reality. Creating new ideas is the life force of the artist. To be successful, another and better idea must be conceived, created, and presented to a world of clients expecting something more creative than the artist's previous work. Nechasin was complex, but Frank and Lally's next work was simpler. Yet, the concept for the piece was meticulous and dictated the design of an entirely handmade rifle and it's paring with a sophisticated beaded sling-strap. Lally's creation follows patterns from a Native American sash belonging to early Kentucky frontiersman Colonel William Whitley. This rare textile is on exhibit at Whitley's estate named Sportsman's Hill, the first brick house built in Kentucky and today preserved as the William Whitley House state historic site. Whitley was the veteran of numerous Indian campaigns and this strap, altered to carry his large powder horn, was most likely a war trophy. 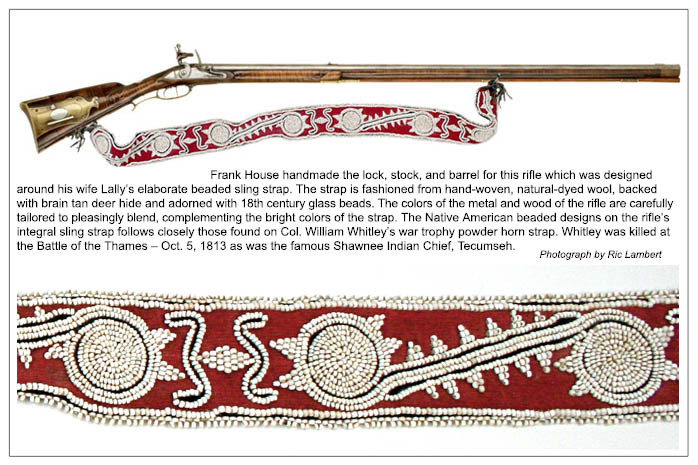 Frank handmade the lock, stock, and barrel for the rifle designed around Lally's elaborate strap, which was fashioned using 18th century beads stitched onto hand woven, naturally dyed red wool. The colors of the metal and wood of the rifle were carefully tailored to blend with the bright colors of the beaded strap. The rifle is based on details and architecture attributed to a school or style of longrifles developed in or around the early Watauga settlement, which was located on Virginia's southwest frontier. It was here that the first majority-rule system of American democratic government was formed in 1772 and called the Watauga Association. In March 1775, the Transylvania Purchase led by North Carolina Judge Richard Henderson, transferred ownership to the Transylvania Company an estimated one million acres of land, stretching from the Cumberland River watershed to the Kentucky River. 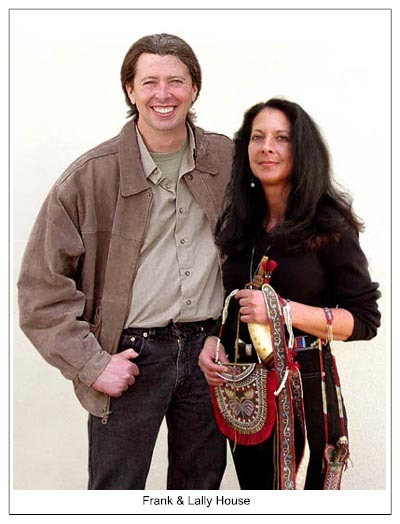 For this land, the company paid the Cherokees 10,000 pounds sterling worth of trade goods. Less than one year after the Transylvania deal, Cherokee warrior Dragging Canoe waged war against the pioneers in Powell's Valley and Watauga in retaliation for the settlers' squatting on Cherokee lands. Reaction to the Indian attacks was swift. On July 14th, 1776, Brigadier General Griffith Rutherford wrote the North Carolina Council of Safety saying that nothing less than a scorched earth policy would suffice in eviscerating the Cherokee threat. 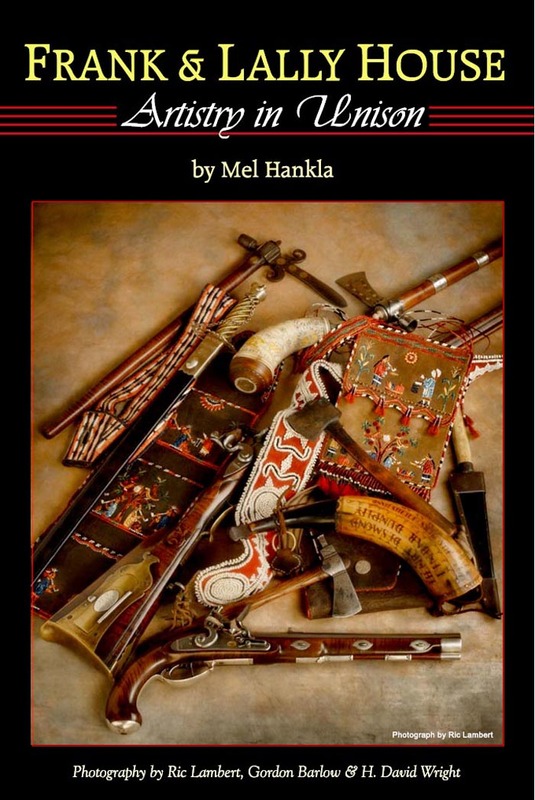 The Cherokee Expedition of 1776, the largest rifle campaign in American history to that time, placed some 6,000 militiamen from the Carolinas, Georgia, and Virginia in the field and executed a near simultaneous military campaign against the Cherokee. William Whitley was among them. His strap could likely be a trophy from this campaign. 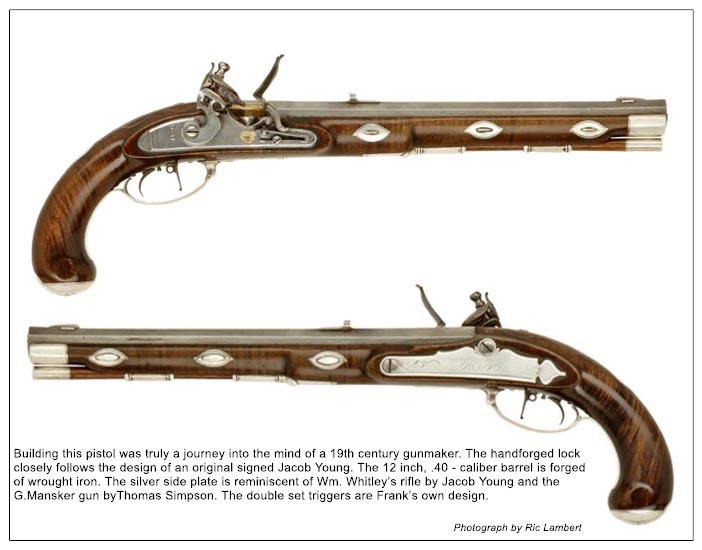 Frank's gun exemplifies arms carried by these riflemen. This work of art stands as an icon for an important time in America's history. The rifle, with its sculptured lines and texture of its sling, evokes images of 18th century life that brings to mind visions of a fascinating journey into two worlds fighting for the same principles, but unwilling to share the same land. Frank and Lally each produce individual pieces, but their collaborative creations showcase their talents in a powerful way that moves their work beyond traditional boundaries of what was accepted as art. Continuing to develop new concepts, each piece of their work is based on thorough research. Private collectors often allow study of original artifacts and they find this study is necessary to produce art that is as beautiful as historically accurate. 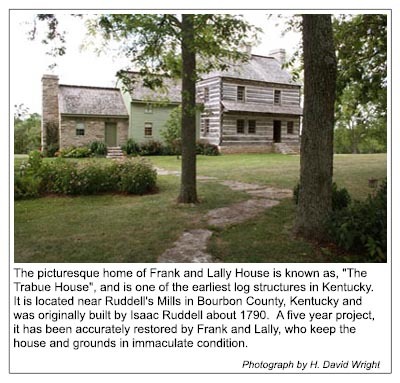 Together Frank and Lally House bring more than 60 years of experience in artistry. Frank reflects, "The longer I do it [art] the longer it takes� because I continually strive to become better and am always learning, attempting something new. We are finally starting to breach the bastion of the mainstream art world." Frank and Lally House are members of the National Muzzle Loading Rifle Association and are familiar faces at Friendship. 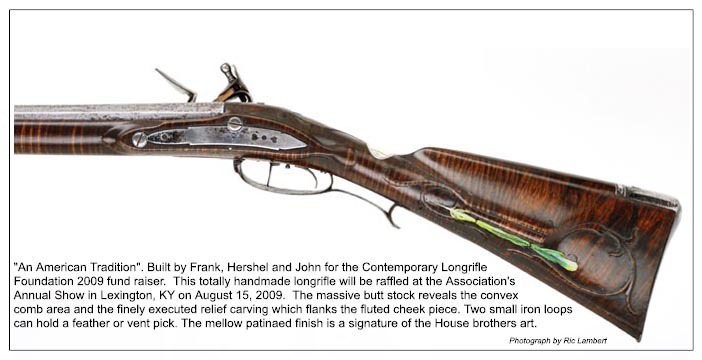 As charter members of the Contemporary Longrifle Association, they have served diligently since 2001 as co-chairpersons of the annual show each August. Also members of the NRA, they have recently represented the Contemporary Longrifle Foundation at the 138th annual meeting of the National Rifle Association in Phoenix, Arizona.